Build Your Own Arduino Powered Pet Feeder! « Adafruit Industries – Makers, hackers, artists, designers and engineers! Build Your Own Arduino Powered Pet Feeder! As a cat lover/owner who can’t always be home during feeding time, I’m loving this tutorial from prnet on instructables! Have you ever been outside your home for a couple of days? Don’t you have someone that can feed your pet during your absence? Or have you ever wanted to automatize the feeding of your pet? CROCCOLINO FEEDER is the answer. I built this project as a little challenge and as funny hobby. Obviously my cat Spritz is always with me. I won’t let him stay more than few hours without me (unfortunatelly I cannot take him with me at work). So I made this little automatic feeder to let him feel more comfortable and at full stomach also if I’m not at home. 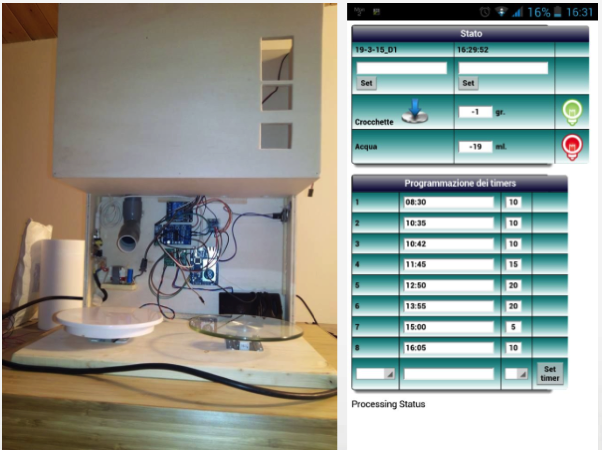 Comments Off on Build Your Own Arduino Powered Pet Feeder!